Whether swimming laps or splashing in the shallow end, a refreshing dip in a crystal-clear swimming pool is Florida's perfect recreational activity. 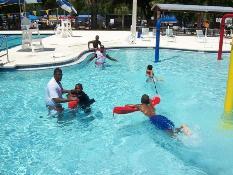 Opened in 2008 in the heart of Daytona Beach, the Cypress Aquatic Center is the city's premier public swimming facility. The facility is located at 981 George Engram Boulevard, which is on the southeast corner of Nova Road and George Engram Bulevard. For more information, please call (386) 671-8392 or (386) 671-8393. The daily admission is $3 for adults and $2 for person 17 years old and younger. Discounts are available for swim packages. Children 7 years and younger must be accompanied in the water by a parent or responsible supervisor at least 16 years old.